August Break: When I Said Bedroll, That’s Not What I Meant – Sunshine. Whimsy. Tacos. I’m on an August Break from my regular blogging schedule. Here’s today’s picture. Living in America, I got used to bedding being flat white slabs stacked up in a mattress store. When I moved here, I did what most people do- I went to Ikea for some affordable, necessary furniture. 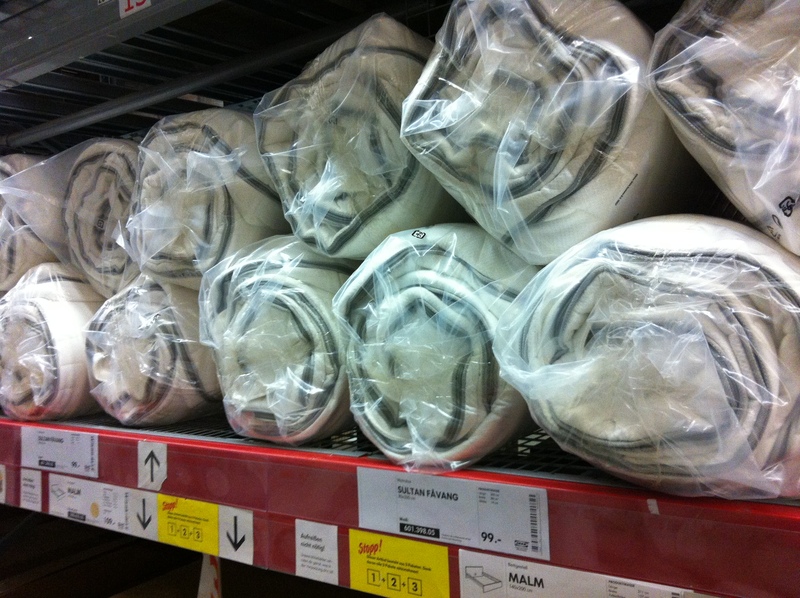 Imagine my surprise when I saw that the mattresses in Ikea start out in this rolled state! When I got it to my apartment, I had to unfurl it and let it sit open for a day or two to fully expand and air out. I also had to get used to the bedding sizes and styles here. I love that German couples usually have separate blankets rather than one big one that they have to fight over share… it’s quite ingenious! Have you ever had an Ikea bed? Did you like it? August Break: What the wash? We have an IKEA bed, though I think we had the mattress before-hand. My husband, then boyfriend, went out and bought a bed (and carried!!! it home on the metro) the night before I came to visit him in Hamburg for the first time. He wanted to impress me and didn’t want to just have his mattress on the floor as it had been. Hah! Oh yeah! Much easier to transport! Whoa…I’ve never heard of such a thing but how perfect for transportation!! I think we got ours at a regular furniture store but it was delivered so this is all news to me! How cool!! We got a furnished flat when we moved to England so no bed transport required. Luckily our lovely landlord provided us with a pretty good bed (though I did buy a matteress topper for extra comfort). It’s like any other bed- some mattresses are better than others. They’re not bad, though. They are much less thin once they’re unfurled and have had a chance to expand. I don’t think it hurts intimacy at all, but your mileage may vary.